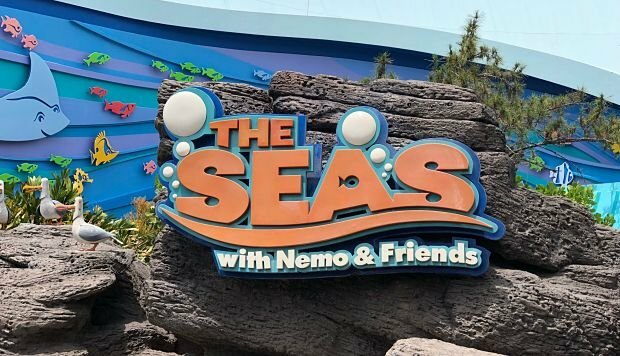 As you approach "The Seas with Nemo and Friends," an oversized "reef" offers a great photo op. Nemo himself makes personal appearances and you may find that some of that coral is anything but stationary. You can hear "Mine, Mine, Mine" from a few of those pesky seagulls while entering. Mr. Ray, Bruce and Crush are among the featured characters that grace the entryway. 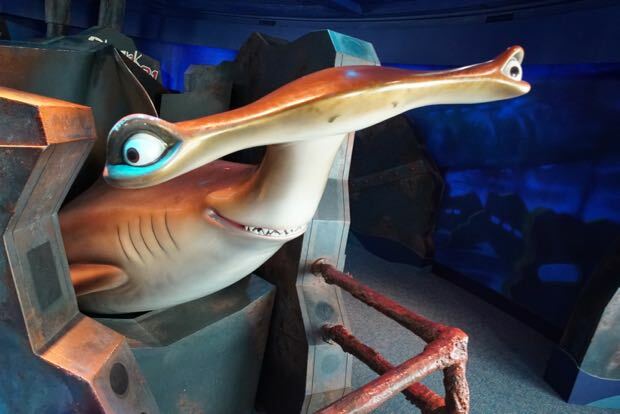 This attraction revolves around one of the largest saltwater aquariums in the world which was developed by Walt Disney Imagineering in consultation with some of the world's foremost oceanographic experts. 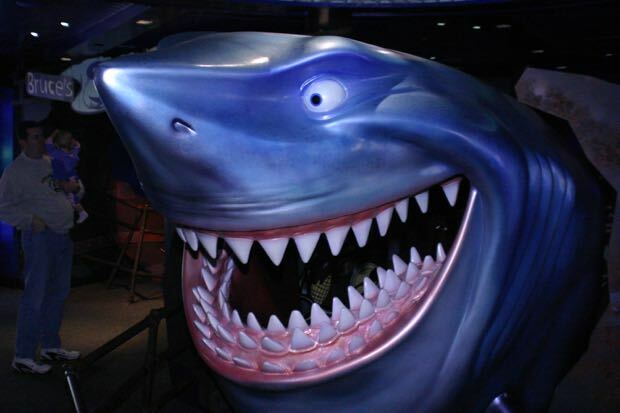 With the focus on the "Finding Nemo" movie, there's a ride, terrific displays and interactive activities for all to enjoy. This aquarium features over two hundred species of sea life including dolphins, sharks, sea turtles, gliding rays and a 500 lb. Grouper, as well as a rainbow of multi-colored tropical fish. The tank is 200 feet in diameter, is 27 feet deep and the glass is 8 inches thick. 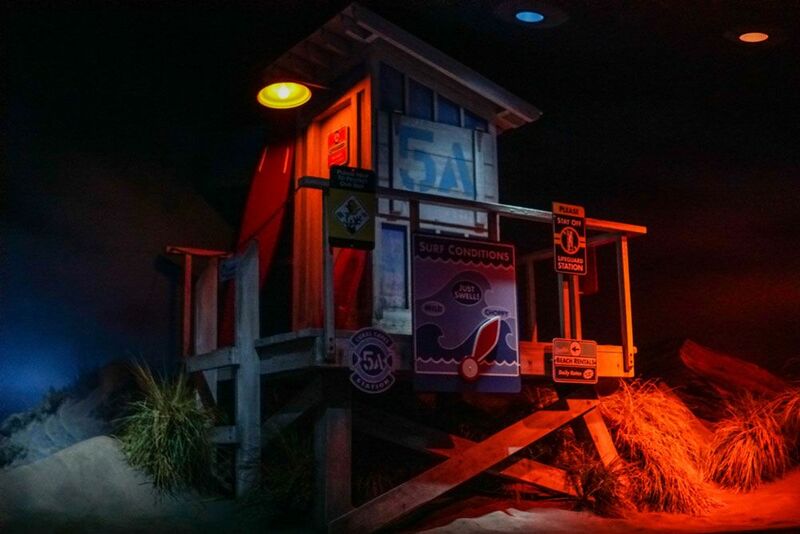 When you enter the building, the queue begins with a seashore setting that transitions to an underwater theme. With the use of special lighting it appears as if you're under the sea. Details include an overhead boat. 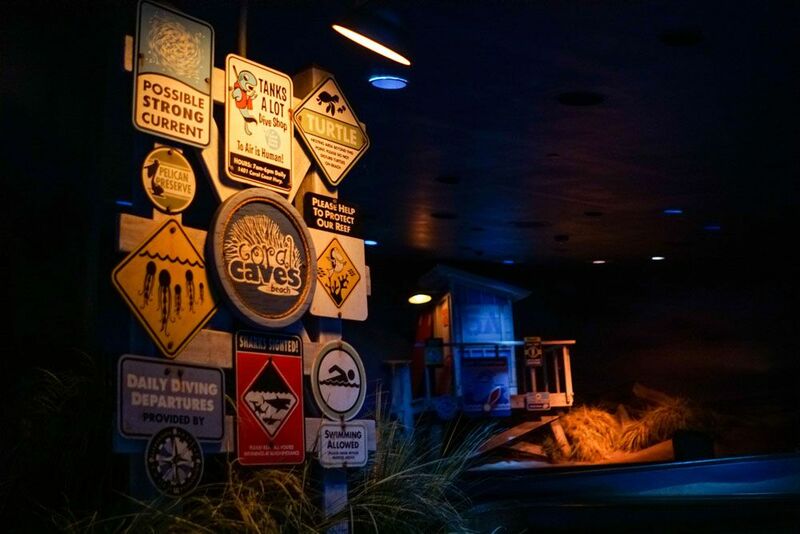 Once guests reach the boarding area, they're transported by "Clam-Mobiles", and join Mr. Ray on a field trip. As you can expect, Nemo goes missing and the pursuit begins. 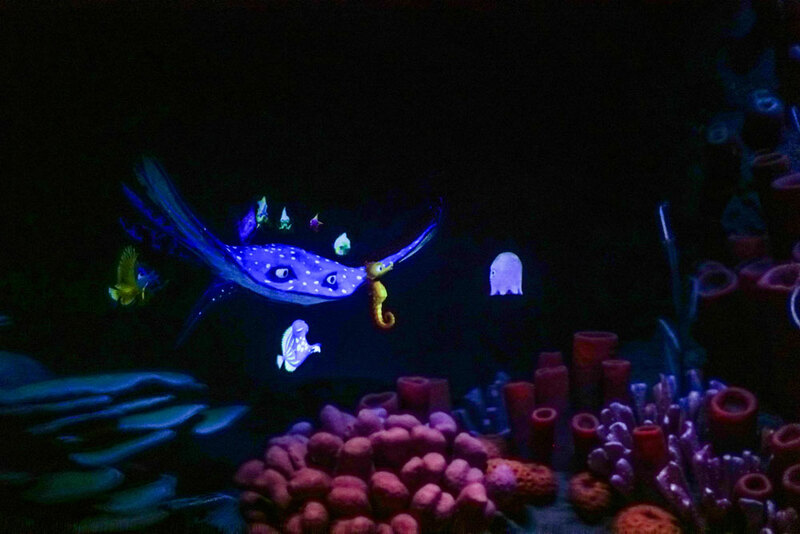 Animation and puppetry combine to make this a fun filled trip into Nemo's world. You'll join Marlin and Dory as they go in pursuit of everyone's favorite clownfish. 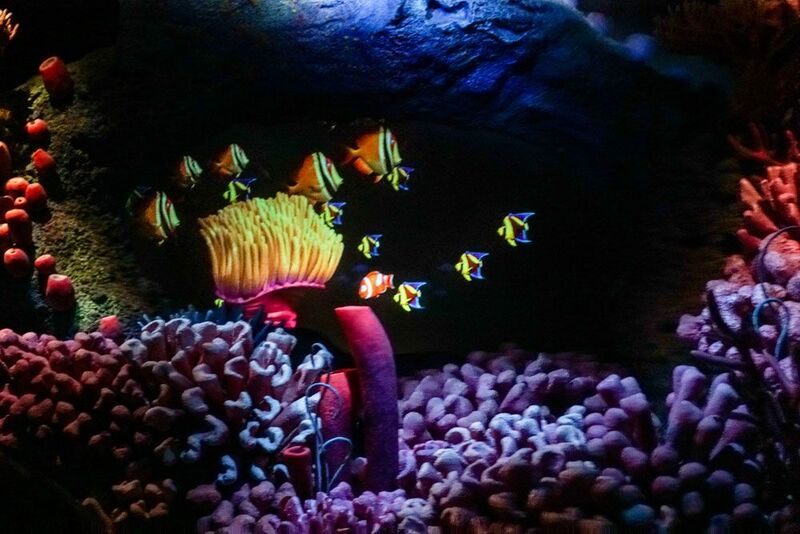 Through the use of amazing technology, it seems as if the stars from "Finding Nemo" are inside the 5.7 million gallon aquarium for the final sequences. The musical finale features Nemo being reunited with his Dad and friends. All of the characters from "Finding Nemo" sing "Big Blue World" as they say goodbye. This attraction is not to be missed. FUN FACT: This pavilion houses the second largest salt water tank in the world (5.7 million gallons). The tank is so large that it could hold the diameter of Spaceship Earth! Handicapped Accessibility: Guests must be able to transfer from their wheelchairs/ECVs. Audio descriptions and handheld captioning are available. After the ride, you're free to explore the rest of the pavilion as much as you want. 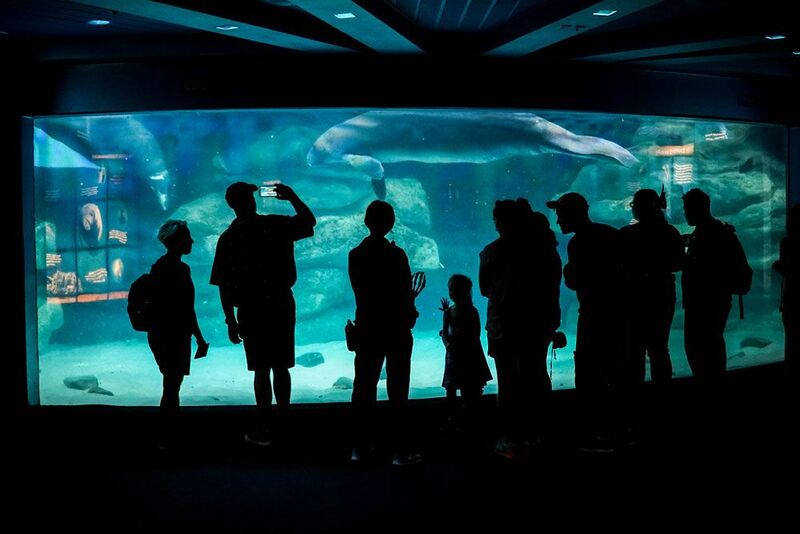 For guests wishing to interact with the aquarium inhabitants, there are tours that you can schedule. If you're looking for Nemo themed merchandise, this is the place to find it. T-shirts, plush, keychains, toys, you name it, they have it here. This pavilion is also home to the Turtle Talk with Crush attraction. 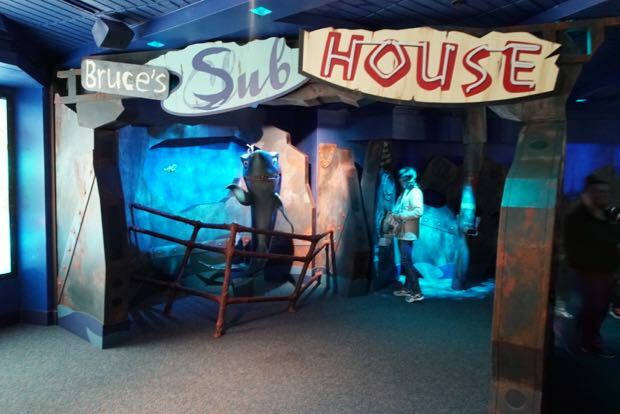 "Bruce's Sub House" is another take on the Nemo theme. It's a new, fun way to learn more about sharks. If you like, you can take your photo either next to or in the mouth of Bruce. There are all sorts of hands-on activities, with some unexpected twists. Be sure to touch the "shark skin" and peek into the periscopes. You definitely get the feeling that you're in an underwater wreck. Kids really enjoy exploring this area, and the adults are certainly welcome to do some "fishing" of their own.